Asia’s rapidly growing social media community now has a new way to manage their presence on some of the biggest Asian social networks. Today, HootSuite is announcing the release of four apps which cater directly to the needs of social media users in the APAC region. 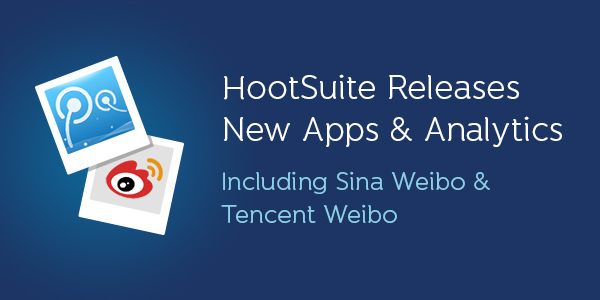 HootSuite has already integrated Sina Weibo and Tencent Weibo via the HootSuite App Directory, Chinese social networks each with over 500 million registered users. Now, those two apps have been enhanced to provide even more functionality to the many users also using the HootSuite dashboard. Plus, power users and businesses can now track their campaigns with Sina Weibo Analytics and Tencent Weibo Analytics apps. This latest wave of apps is part of a large push made by HootSuite to strengthen its presence in the APAC region. In the last year the product has also been translated into several languages, including Traditional and Simplified Chinese, Thai, Bahasa Indonesian, Korean, and Japanese, and we’ve expanded our APAC team, including a brand new office in Singapore. HootSuite’s Sina Weibo and Sina Weibo Analytics by Klarity apps help enterprises drive meaning and action from social conversations. The Sina Weibo and Tencent Weibo apps allow users to search, share, schedule and re-post content, monitor feeds, as well as view and post comments. Users can also share Sina Weibo and Tencent Weibo content simultaneously across other social networks, bridging social networks to create a truly synchronized social presence globally. Download the enhanced Sina Weibo app here. Download the enhanced Tencent Weibo app here. Easily Share unique content you discover on Tencent Weibo to your HootSuite Social Networks. Businesses operating in the Asia Pacific market are interacting in an array of languages. For companies active on Sina Weibo, they rely on data collected from engaging with the Chinese online community. 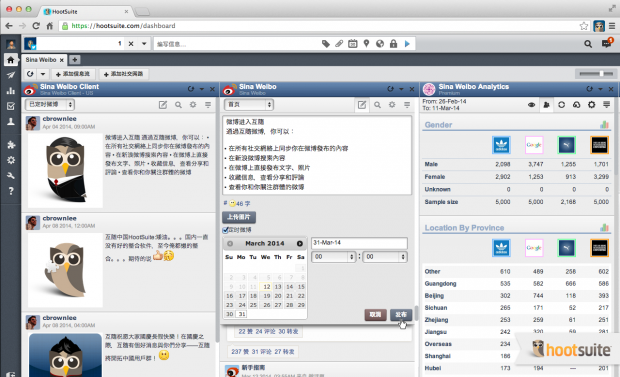 Klarity’s Sina Weibo Analytics and Tencent Weibo Analytics apps for HootSuite enable companies and brands to decipher data beyond the English language. With the ability to recognize Simplified and Traditional Chinese characters, this app empowers companies to compare all data available on both the Sina and Tencent Weibo networks. 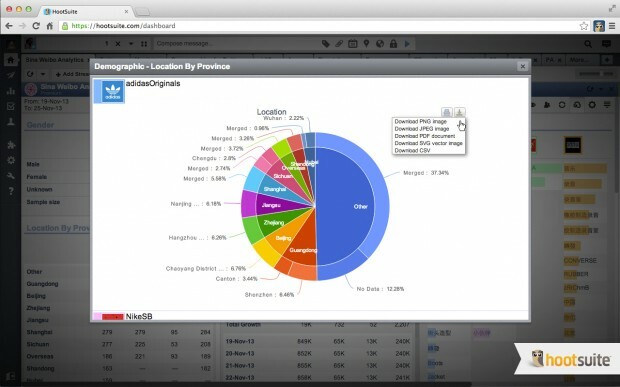 Easily generate data, for example brand reach and mentions, focusing on a single brand or benchmark against up to 3 competitors via the HootSuite dashboard. 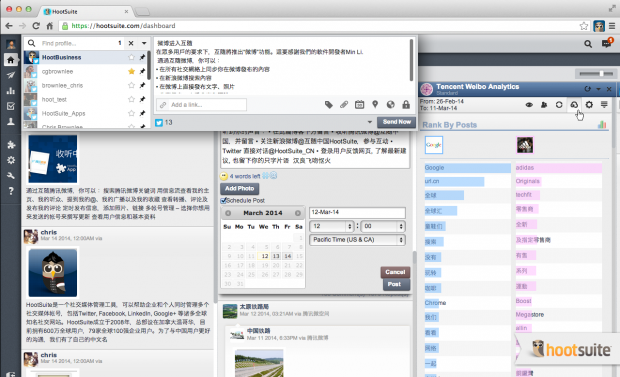 HootSuite’s Tencent Weibo Analytics apps by Klarity helps enterprises drive meaning and action from social conversations. Download the Sina Weibo Analytics app here. Download the Tencent Weibo Analytics app here. Want to expand your presence on these social network but not yet a HootSuite user? Sign up today. Did you know that our App Directory has 90+ apps that help enhance your brand presence and enrich your social experience? Check them out today. Need help installing apps? Check out our App Directory Guide. Also, be sure to follow @HootSuite_Apps for the latest updates and news on the HootSuite App Directory. Are you an organization or developer that would like to work with HootSuite? Learn how you can integrate your app using the App Directory SDK.